A Guide, YOEXPLORE - Have you ever been to Bandung? Most travelers who have visited Bandung call this city a city to pursue happiness while traveling. Perhaps due to the fact that Bandung offers a variety of unique experiences that are worth exploring. 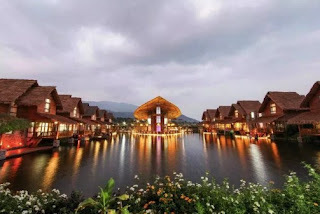 Some travelers can visit Bandung to enjoy its enchanting nature, some others can enjoy the richness of their local cuisine, and others can enjoy the shopping center. Moreover, this city is also famous as a place for halal trips. No wonder there are many Muslim tourists who enjoy Muslim tourism in Bandung to explore Bandung. How about you? Have you visited Bandung? I would love to know your thoughts about Bandung if you have visited this city of "Paris Van Java". Please leave your comment below! If you have not visited Bandung and plan to do it, keep reading this article because I want to share 4 things that can be done in Bandung. Let's start your vacation! My first recommendation for 4 things to do in Bandung is to explore Lembang. There are many unique sights here that you should not miss. Although it is known as a place to chase fresh air, it is also a good choice if you are traveling with your family because of the various family-friendly attractions available in this city. One of them is Floating Market. Here, you can enjoy a variety of local dishes offered by local sellers who sell their products through their floating boats. In addition, your children can enjoy trying out various games available in this market. After enjoying the attraction of a floating market, you can continue your visit to explore the Farm House near this market. The Farm House is famous as a tourist destination with a European feel. Enjoy your time to take pictures on many Instragrammable places available in this area. In addition, if you are an adventurous traveler, you might consider traveling to Cikahuripan. This is one of the most recommended destinations for mid-advanced climbing experiences. Not only does Bandung become popular through various attractions in Lembang, but also through amazing scenery in the Ciwidey area. That's why; Ciwidey is my next recommendation for 4 things to do in Bandung. One of the destinations worth exploring in Ciwidey is Kawah Putih. This is a lake made from the eruption of Patuha Mountain. The uniqueness of this crater is the color of water, which always changes to adjust sulfur levels in lake water. You will definitely be amazed by the green natural scenery surrounding this crater. In addition, Kawah Putih is also a recommended place for anyone who wants to take pre-wedding photos. From KawahPutih, you can continue the journey to explore Situ Patenggang. Here, you can explore tea plantations, go fishing, or spend your time in hot tubs in Cimanggu and Ciwalini. 3. Shopping, Shopping, and Shopping! It's no secret if people in Bandung have good fashion tastes. Bandung is even known as the center of youth fashion. This characteristic is the same as Paris which is also known as the center of fashion development in the world. Because of this iconic tourist attraction, Bandung is known as Paris Van Java. So, yes you are right, my third recommendation about 4 things to do in Bandung is shopping in this metropolitan city. The best place to shop for quality items is at the factory outlets in Cihampelas and Cibaduyut. You can even enjoy cheaper prices compared to other factory outlets in other cities, especially if you want to buy jeans. Cihampelas is a place where you can find quality jeans at affordable prices. No wonder this area is also known as "Central of Jeans". But, if you want to buy shoes and bags, you can come to Cibaduyut. In Cibaduyut the price of shoes will be cheaper because this place is known as a shoe factory. Besides the beautiful scenery and shopping experience in Bandung, there is one thing that you should not forget to explore when you are in Bandung. Explore local cuisine! You should try Baso Tahu Tulen, Nasi Kalong, Perkedel Bondon, Bageur, Peuyeum, Colenak, Karedok, and many more. Maybe some of you are already familiar with this food, but if you try it in his hometown, it will definitely give another sensation. It can taste better! Good luck!